L had previously used some clay at school for modelling, but this was the first time for A. We used white air drying clay, which I bought at Bunnings. 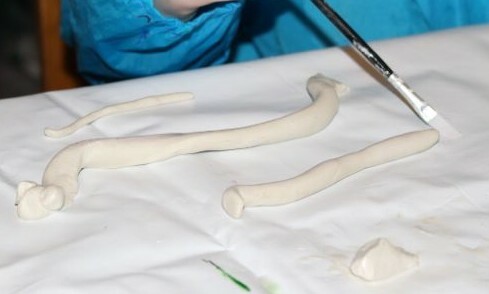 The clay was easy to work with, and the kids treated it much like they would have play dough. 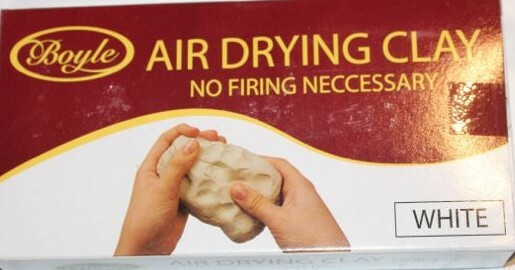 They enjoyed the sensation of squishing it in their fingers, and rolling it into balls and sausages. Once they got down to the serious business of shaping their monsters we added a little water to the clay to make it sticky enough to create features. Working with wet clay can get pretty messy too, so we worked on a muck mat, and had damp tea towels for hand (and face) wiping as necessary. Using a paint brush to add detail. I let the kids decide what kind of monsters they would model, yet both of them decided to make serpent monsters. Neither of the kids are particularly keen on snakes, so perhaps they thought snake-shaped monsters would make very scary clay monsters. Making the clay smooth with water. A made her clay into a long body with a little head, while L made her snakey monster with a huge head and fangs. L used a paintbrush to add some details to her serpent, such as a mouth. A painted water along the body of her snake until it was very smooth. Her monster really looked like a snake, but she assured me that it was a really terrifying monster. A also made a funny little spotty blob monster, which she said was like a germ. 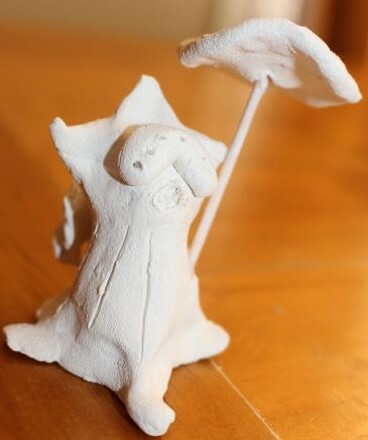 I also made a clay monster of my own, because playing with clay is just fun. 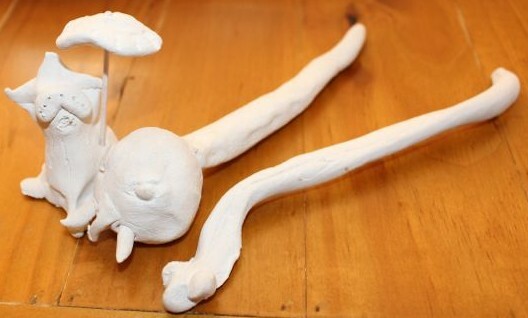 My monster was a bit of a blob with four feet, and numerous eyes made by poking the clay with a toothpick. 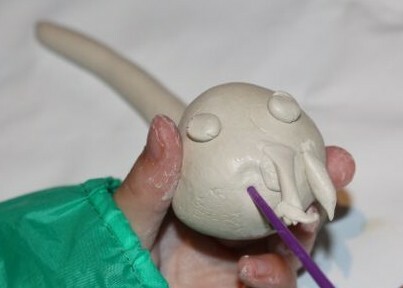 It is also holding a clay umbrella with a toothpick handle. The umbrella was L’s idea, and I love it, it made my monster very quirky, especially since it doesn’t have hands or even arms for that matter, so I think it is holding the umbrella with its side! It has a tail that looks a bit like the opening of a trumpet, and three spikes on its head, but no nose. We placed the monsters onto plastic wrap so they wouldn’t stick to anything, and then left the monsters to dry completely, which took a few days. This was not helped by a bout of rain at the time, keeping the air moist. While they were drying we were careful not to move them or bump them. L thought she might like to paint her monster once it was dry, but in the end we left them as is. I quite like all of the clay monsters that we made, and we have placed them onto a shelf for display.